So I decided to try poaching some pears. Poached pears are usually made with wine and I thought this would be a perfect opportunity to see what a beer could do. I figured a tripel might work well so I went with Victory's Golden monkey. The hints of fruit and spice in the beer were a great match for the cinnamon and vanilla I used in the poaching liquid. The combination of all of it simmering away smelled seriously good. I started by peeling and coring four pears. I filled a pot with a bottle of the beer and a bit of water so it would be enough to cover all the pears. Then I added some cinnamon sticks, vanilla, and sugar. I brought the poaching liquid to a boil, then reduced the heat and added my pears. I let them cook until nice and tender. After removing the pears, I continued cooking the liquid until it was reduced to a yummy syrup. For the stuffing I combined mascarpone, blue cheese, walnuts, and some of the syrup. I made a little chocolate sauce with cream, semi-sweet chocolate, and butter. Stuffed the poached pears, put a little syrup on them, and then placed them on top of the chocolate. Pretty huh? This is actually one of the most successful pairings I've tasted. 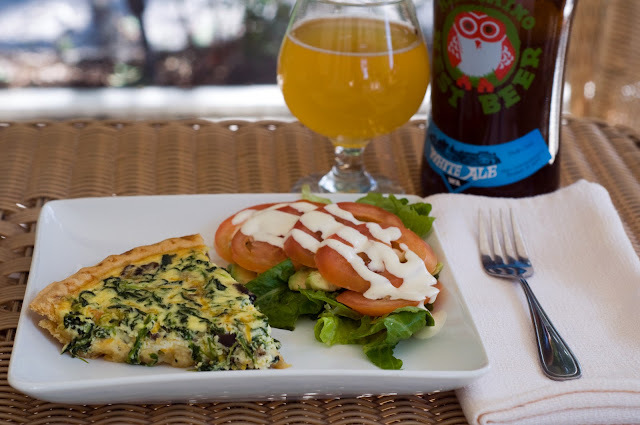 Two wonderfully light and fresh components: a delicious quiche (mine included spinach, mushrooms, cheese, and onions) paired with a slightly tart witbier. Hitachino Nest White Ale, like most witbiers, is a perfect pairing for these kinds of brunch foods. You get all of that awesome spice, citrus, and yeast flavor (possibly my favorite flavors in beers) paired with a fluffy quiche and a citrusy salad. The creamy lemon dressing I used for the salad really took the pairing to the next level. It was a perfect match for the refreshing citrus notes in the beer. With every bite and sip back and forth, each component of the pairing tasted better and more interesting. That's what beer pairings are really all about: combining beer and food to allow the the flavors of each to shine through. Anyway, I have to say, I can make a pretty damn good quiche. I think the key to a perfect quiche is to not use too many eggs because it becomes too dry. But that's just my opinion. I do about 3 eggs, 1 1/2 cups of heavy cream (or half and half), 1 cup of cheese, and then whatever I want to fill it with. For this, I sauteed the mushrooms and onions first and then layered them and the spinach into the crust followed by the cheese and the egg/cream/seasonings mixture. Then just bake until set. I bought some blueberries a while back and totally forgot about them until today, so I figured I should use them quickly before they got moldy. I was thinking of making a sorbet with them (I haven't used my ice cream maker in so long!) 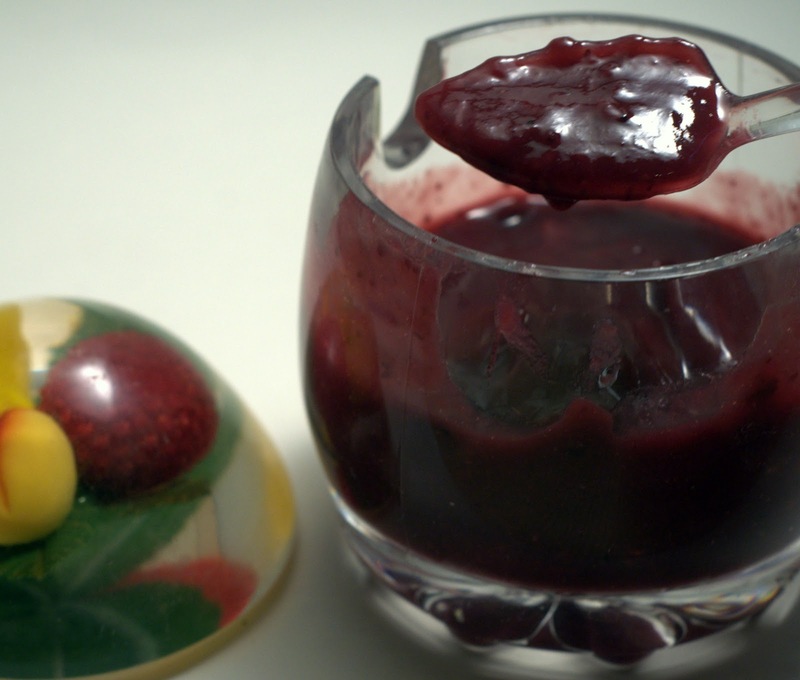 but everyone in the house was craving something more like this. So I just cooked up some blueberries and strawberries with sugar and a little lime juice. Then placed the filling on puff pastry dough and baked them. 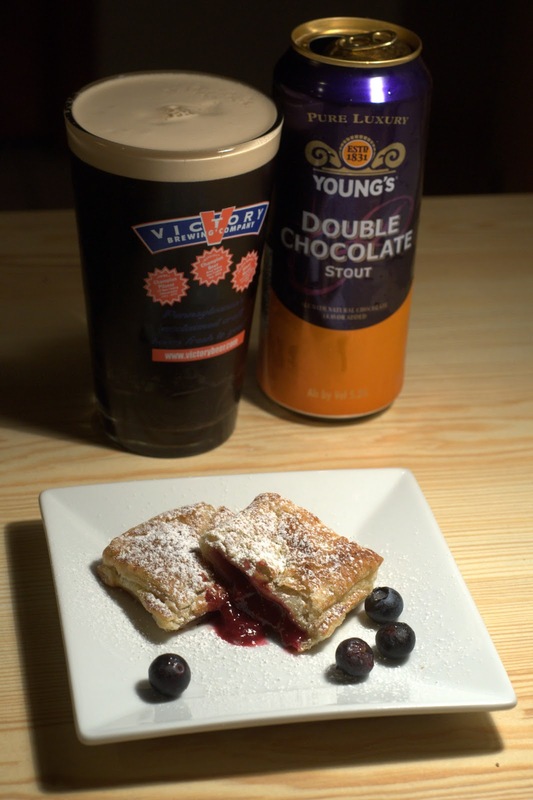 For the pairing, I decided to try it with a can of Young's Double Chocolate Stout that was lying around in the fridge. Such an easy drinking creamy beer, it was almost like having milk with my dessert. But the subtle chocolaty flavors paired nicely with the strudel. I think it'd also be really good with a bigger, richer stout, but I liked that the beer didn't overpower the dish. Just as a side note, my mom made aji de gallina today. It's a slightly spicy Peruvian dish with shredded chicken in a super creamy sauce. It's usually served with rice, potatoes, and hard boiled eggs. Damn, sometimes I think I should have a Peruvian food blog. You guys have no idea how good some of that stuff is! Anyway, so Brian came over today to have some aji de gallina (his favorite) and paired it with Young's Double Chocolate as well. It was a surprisingly amazing pairing. I think it was the creamy textures that worked so well together. Or maybe the sweetness of the beer with the spicy chicken. I couldn't stop going back and forth between the dish and the beer. Good stuff. Anyway, I got off track. 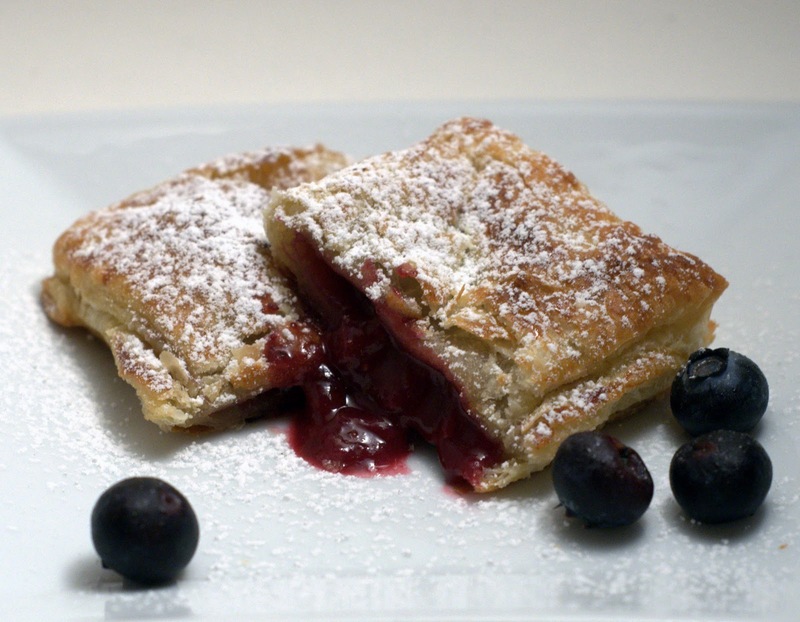 We had some extra blueberry filling so I saved it to use as a jam. We ate it with crackers and different types of cheeses. Yum yum. Also had some of the strudels with blue cheese on top. I don't know if you're aware, but putting a fruity filling inside a puff pastry and eating it with blue cheese is amazing. I don't know why, but it's something I always do.